Spent an entire Sunday morning at Pike Place Market in Seattle Washington a couple of weeks ago. It was my first time visiting this incredible food market. I was blown away with the intense heavy scent of flowers that welcome you into the building. The sunflowers and dahlia’s were mesmerizing in size and were everywhere I looked. They sold spectacular flower arrangements for only $10.00 in every color a girl could ask for. Besides walking past every kind of flower you could ever want, my husband and I tasted Beecher’s handmade cheese. The varieties of seasonal fruit were overwhelming finding juicy nectarines, plums, berries, sweet currants and cantaloupe just to name a few. We spotted boxes of colorful organic peppers and just around the corner and a collection of mushrooms some I’ve never heard of like maitake, eryngi, nutty shimegi, lobster, chanterell, and matsutaki for the chefs delight. It was honestly a foodies paradise. I was in Heaven. I was excited to spot Gosanko Chocolates and check out their special chocolate offerings. They had dark chocolate rocky road, clusters of sunflower seeds coated in chocolate, peanut raisin, almond, walnut, and cashew clusters. 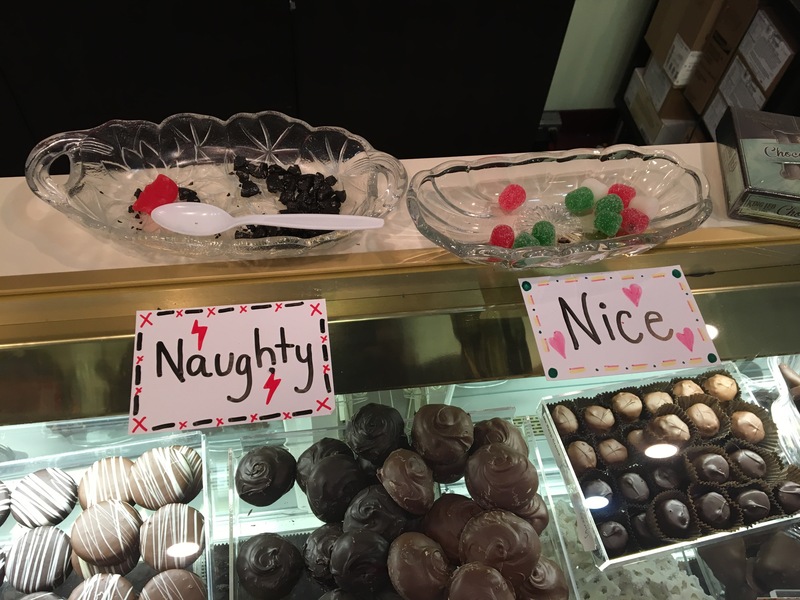 I spied red velvet, sea salt caramel and PB and J fudge, and blackberry, strawberry, mocha, Irish cream, loganberry, peanut butter, limoncello, kahlua,grand marnier, cherry, rum and classic truffles. I wanted one of each! And of course I’m partial to almond butter toffee coated with dark chocolate. Yum! If I could travel around the world and just visit chocolate shops, I would. Most of the time I try their hot chocolate since this is always a measure of a good quality chocolate. Next we came across local farm fresh Raw and Pure Honey and discovered wildflower and blackberry flavors. There were gorgeous really cool textiles like cotton scarves in bright primary colors and artists previewing their spectacular pieces. Too bad we were staying at a hotel because I wanted to buy and cook the huge assortment of fresh caught trout, salmon, red snapper, rockfish, and halibut just waiting to be fried or grilled to perfection. The dungeness crab and jumbo king crab legs were enormous and reasonably priced. Apparently the cherries in Washington are abundant and family owned since 1988 Chukar Cherries Co. provided delicious chocolatey samples if you could stand waiting in the long line. There was plenty of hot food for those that wanted a nibble with displays of fried chicken, tempura shrimp, corn dogs, chicken tenders and French fries. And of course we came across the bakery selling savory cheddar cheese rolls, chocolate dipped cookies, German chocolate and cream cheese strawberry donuts, Swedish cookies which my Danish great grandmother Helga “Nana in the white hair” is what we called her, would have wanted, cinnamon crispies (which reminded me of a pastry I had in Truckee. Here’s a previous blog with a gingerbread recipe I’m fond of and made recently) and peanut butter cream cheese cannoli’s. Yuck. My gingerbread cake! So delicious! I loved the lavender products offered by https://www.allthingslavenderseattle.com/. Baker’s dream of ingredients like these: lavender sugar, lavender and sweet orange infused honey, and tea’s for ice cream, scones and other sweet goodies. I bet you didn’t know I’m a cheese fanatic either. My sister Julie introduced me to cheese spontaneously many years ago and I fell in love. Pike Place Market has a good deal of delicious gouda, asiago, fontina, pecorino romano, parmegiano, and lots of soft cheeses too like chevre, sheep milk feta, burrata, mozzarella, and brie. I’m planning on making a roasted cherry tomato with burrata tonight for my family. I first experienced this at a fancy restaurant in St Helena. It was simply decadent. Britts Pickles sold us a jar of their spicy pickles, but unfortunately for my son Curtis they were confiscated at the airport. I’ve seriously have barely scratched the surface of what Pike Place Market in Seattle has to offer. If you haven’t been, it’s a must. This vacation get away was one of my favorite vacations ever. Great food, a hippie vibe/nerdy kind of people, and super fun hikes are awaiting you. Have you ever been? Share your Seattle experience with us. I would love to know your thoughts. And just in case you are inspired to bake, you can find a tasty blueberry lemon bread recipe below. It’s one of my favorite breads to make and share with your friends and family, especially if you have an excess of lemons. In a mixing bowl cream the room temperature butter and granulated sugar for @ 3 minutes on high. Add lemon zest and eggs and blend for 4 more minutes on med high. Sift flour, baking powder and salt until combined. Alternately, starting with dry flour mixture then milk , add to wet creamed mixture in small portions and mix on low until combined. Toss in blueberries coated in 1 T flour. Line a 9X5in loaf pan with parchment paper, or coat with vegetable shortening. Pour batter into pan and bake uncovered for @ 55 minutes or until a toothpick comes out clean. While loaf is baking, juice lemons and mix with powdered sugar. When loaf is taken out of oven, poke with a wooden skewer and pour sugared juice over loaf. Cool. Imagine how surprised I was to stumble upon this quaint neighborhood called Elmwood when dropping off my family room rug to get cleaned. My mother has been having her rugs professionally cleaned at Tulanian Rugs for over 50 years. I was somewhat of a skeptic, never having my rugs cleaned outside of my home before. I always hired someone to come in and clean in the past, but I trusted my mom since she had a good experience there. First I called and spoke to a very pleasant woman who answered lots of questions that I had. She knew a lot about how to care and clean a rug that has been around pets, etc… I felt so comfortable bringing my rug to her that I brought two of them in! I discovered restaurants like The Elmwood Cafe . There was a line going outside the door. Must be goooood. I decided to grab a menu and see what else I could find. I didn’t get far before I found a restaurant called Summer Kitchen. This place looked extra yummy too. I hope no one saw me drooling over the pile of fried chicken sitting right behind the counter. They also had several salad offerings, made to order sandwiches, pizza and nightly dinner specials like chicken from the oven, spicy braised pork, and Arctic char for @ $20.00. What a deal. Not ready to decide what to eat I kept on. Next I stopped into Mrs. Dalloway’s Book Store. I enjoyed their literary selection, but I couldn’t get enough of their garden art and cooking selection gifts. I found really cool wrapping paper (I’m a sucker for colorful anything) and adored their displays of Mother’s Day gifts and Grad Cards. So fun. I was happy to find Kerry Moriarty’s Jewelry shop 14 Karats. Just that week I lost a back to an earring and needed to replace it. 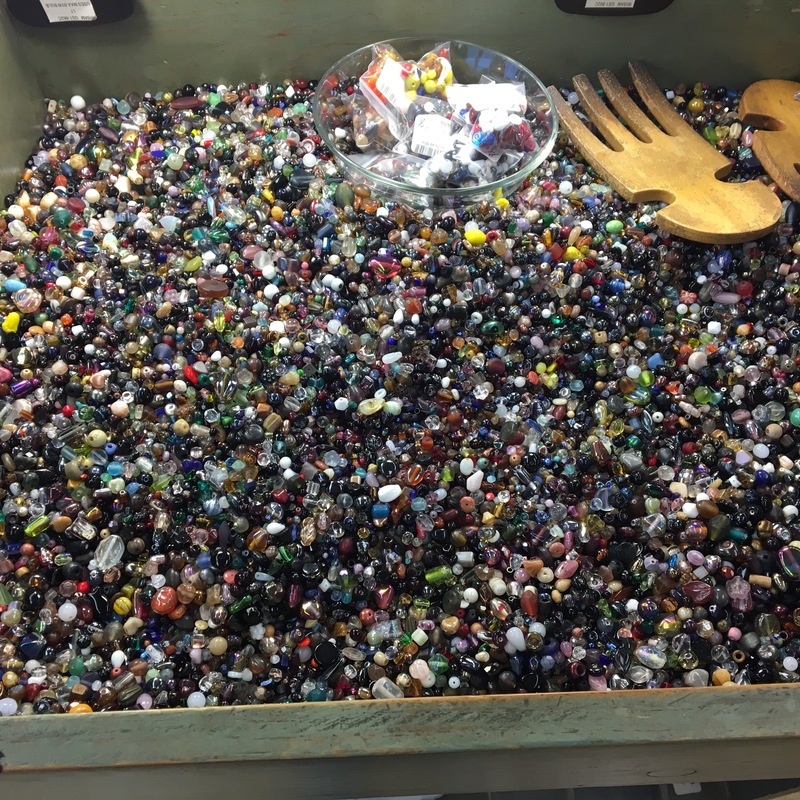 I also lost a stone in a special bracelet that my husband bought me in Thailand. I happened to have them both in my purse and was able to get Kerry to help me out for a reasonable price. When I went to pick up the bracelet, he and his wife gave me their special Hot Sauce that they playfully call”Jo Boo’s” make from scratch. They have been making it for years and even brought it to “Burning Man.” It has several different chili’s in it including the famous ghost chili. Can’t wait to try it. His wife also worked as a caterer for years and generously gave me a piece of her famous dark chocolate almond crunch. Sooo good. Just around the corner I found Nabolom Bakery & Pizzeria . I was told to try their pizza by the guy in the Sweet Dreams Candy Shop. Yes I love candy too. I’m a sucker for a piece of a good quality dark chocolate and almond bark. To my disappointment, the bakery only serves the pizza from 11-2PM and then from 4-7PM and it was already 2:45PM! I opted instead for a chunk of focaccia bread with caramelized onions. I gobbled it ALL up on the drive home in the car. It was warm, and chewy and salty and perfectly baked. I was a happy girl. The pics below were taken the following week when I went back for the pizza. Don’t forget to check out Casa De Chocolates in case you want to satisfy your sweet tooth with a nice cup of hot cocoa with a hint of chili in it. 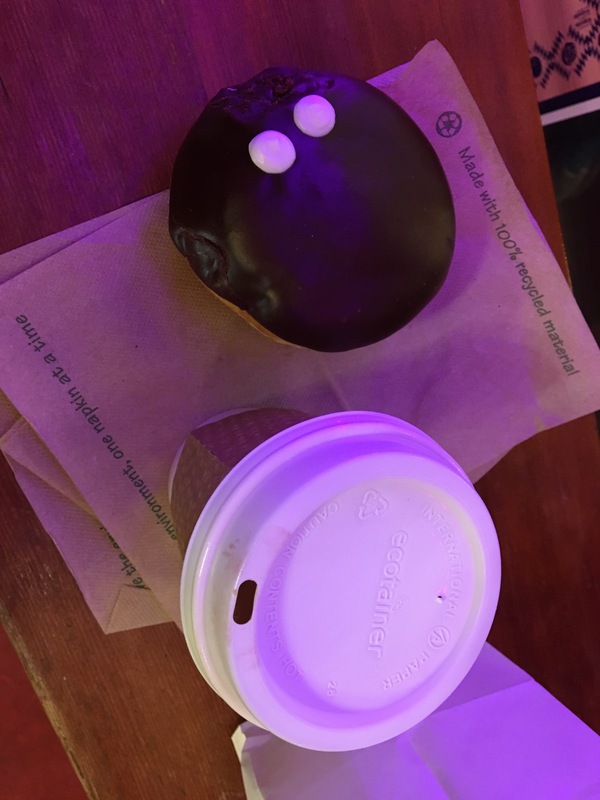 This tasty treat was very chocolaty and the perfect pick me up after a long afternoon of shopping. In addition to their hand made boxed chocolates, this company specializes in making Latin American chocolate bars and desserts like flan, tres leches cake and Mexican wedding cookies. Lastly, but not least I happened upon a small women’s clothing shop called Rue Atelier I met the owner Barbara who was adorable and she told me a little more about the history of the area. The Elmwood neighborhood was hit hard when the popular Lululemon moved out of the corner property recently. I felt so bad for her that I had to buy a really cute blue jean jacket that i found on her sale rack for only $35.00- just my size. Barbara even posed for a pic with her dog for me! I couldn’t help myself, but walk into The Ashby Marketplace. In this store you could find local produce, plenty of artisan gluten free varieties of rice flours, coconut flour, ground corn meal, wheat germ, baking powders, baking sodas and many more extra ordinary options for the baker enthusiast. I could go on and on about the fun businesses that this end of Berkeley has to offer. But, why don’t you go see it for yourself? You will be glad you did. Go hungry. Be ready to shop for cute chic clothing and go there for great new books or gifts. Goodness knows I will be heading back to the Elmwood neighborhood in Berkeley again real soon. My husband will love it too and he will be happy to know we have clean rugs again. Just in case you would like a new chicken/pheasant recipe, here it is. My husband’s coworker was looking for a good recipe and I promised her I would add it to my next blog and share it with her. I had this delicious meal at a neighbors home one night after her husband came home from pheasant hunting. There is nothing low calorie about this dish, but you will be glad you tried it. Directions: Saute Onions, Mushrooms in Olive Oil and Butter until Onions are translucent about 7 minutes adding the minced garlic at the end so garlic doesn’t burn. Place Pheasant in ungreased 9X9X2 baking dish. Mix Soup, Cider, Worcestershire Sauce, Salt, Pepper in a small bowl until combined. Add cooked onions, mushrooms and garlic and stir. Pour mixture over pheasant and sprinkle with paprika. Bake uncovered in preheated 350 degree oven for 1 ½ -2 hrs or until fork tender basting occasionally. After 1 hr, sprinkle the pheasant with more paprika. Enjoy! Follow me for more delicious recipes and fun adventures. Also I’d love it if you could take the time ask a question or leave a comment below. Before I divulge the best toffee recipe of all time, I will share a quick story about my recent vacation. Here is a pic of my niece Kendall helping me in the kitchen. What a trip! My husband and I traveled to Portland Oregon this week for business and pleasure. I was excited to get away and have fun exploring the food and vibe in the Great Northwest. The day started with a trip to Voo Doo Donuts after dropping my husband off at the refinery. It was my first time trying these fabulous baked goods. People go crazy for these donuts. 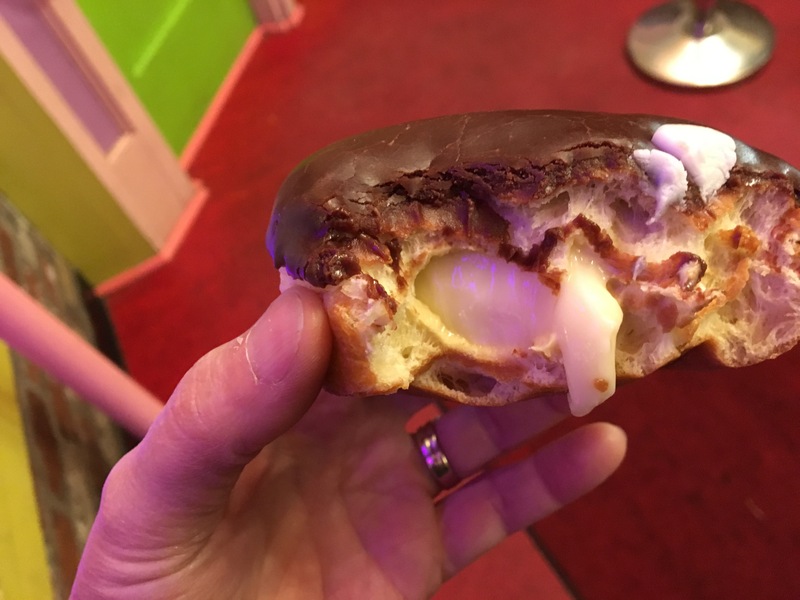 One lady in line bought seven dozen and another guy walked out with four dozen glazed, sprinkled, filled and twisted… the list goes on and on. I was happy with my two-one raspberry filled dusted w powdered sugar and one glazed with chocolate and filled w pastry cream. So delish! The place reminded me of a Hard Rock Café kind of place. It has a weird kind of vibe with skull and cross bones and biker chic like culture. They sell music CD’s and T-shirts w logos like “The Magic is in the Hole.” And I might add that we saw a few people in the airport carrying huge pink Voo Doo Donut boxes too. Apparently there is usually a line out the door of this place. 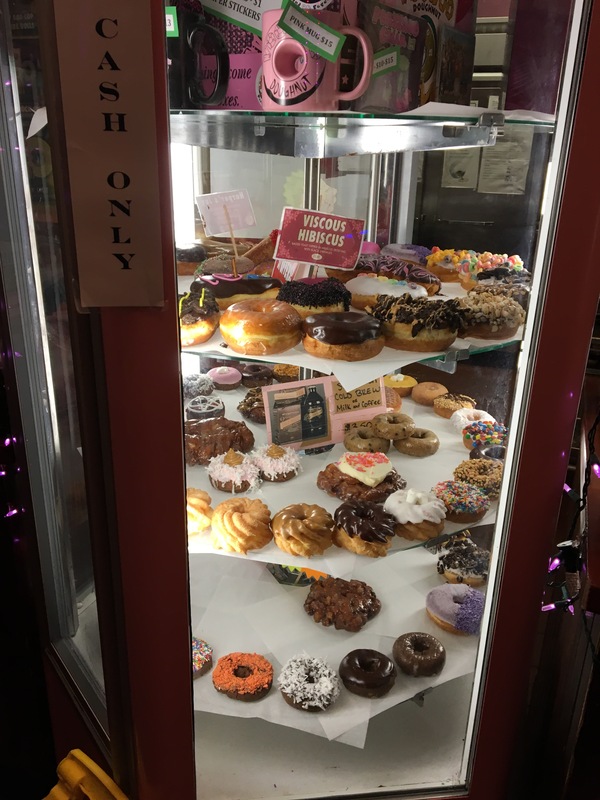 Today, this wasn’t the case but there were plenty of visitors taking part of the “Voo Doo Donut experience.” The shop is small. No seating is available. I chose to stand at the back counter and eat the chocolate one w Bavarian cream first. It didn’t disappoint. The Stumptown coffee was watered down and not anything like the normal Peet’s espresso w steamed milk that I make for myself every morning. 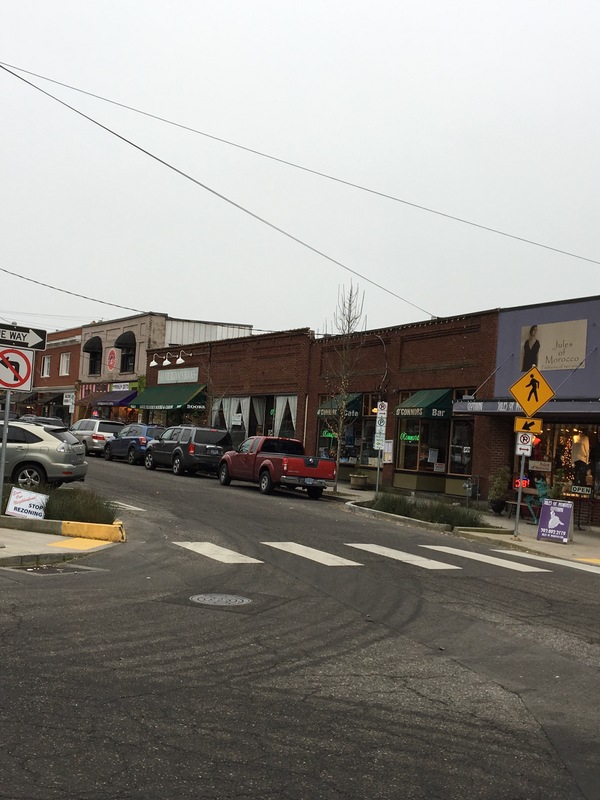 Next I explored the shops in the Multnomah Village and Hillsdale Shopping area of Portland. Here I wandered around in this cute quaint small neighborhood. I found everyone there to be friendly, helpful and knowledgeable about their goods. I was able to pick up a couple of last minute Christmas presents for a few people on my list. I found a cashmere scarf for my son who will soon be traveling to So Korea for a business class. He will be sure to find a good use for it there. After visiting a bead store, I also got the great idea to bedazzle my Christmas packages w brown twine and lace them w sparkly beads in blue, red, clear, yellow and some that look like diamonds. This will be the perfect addition to my holiday wrap. I love decorating a gorgeous tree every year and placing beautiful packages under and alongside the ornaments and brightly lit tree. 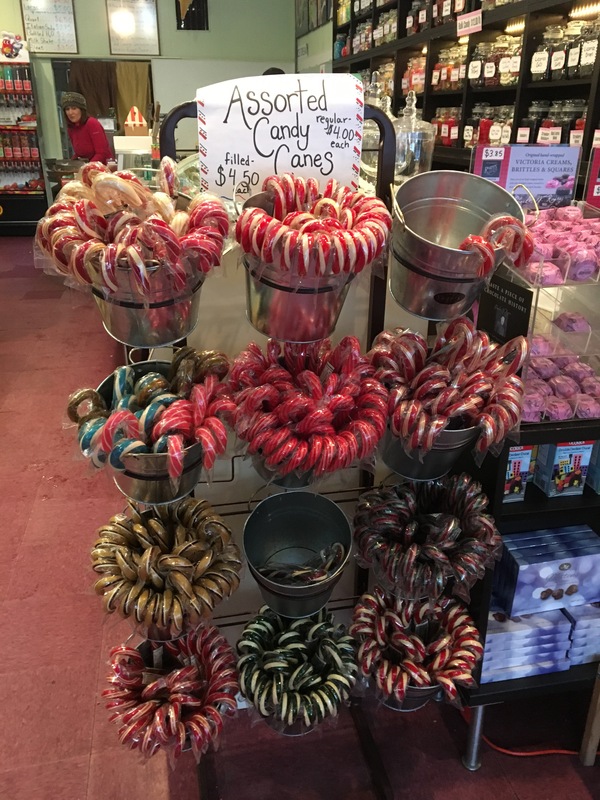 I also spotted an old fashioned candy store called Hatties which had every kind of candy you could think of. I brought home peppermint candy canes to make my chocolate and peppermint cream cheese brownies and root beer, licorice, butterscotch and orange flavored lollipop sticks to add to the gifts of the kids on my list. Remember the ones you had as a child? 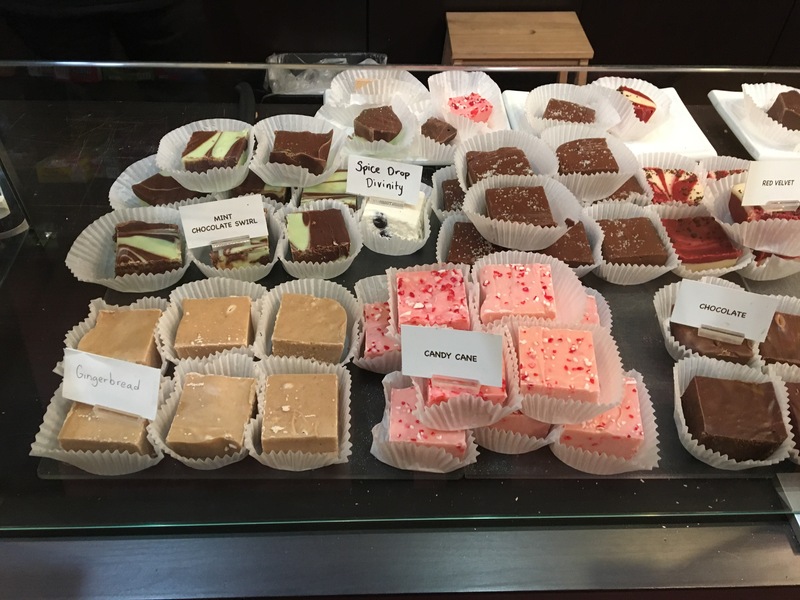 They also offered many varieties of homemade fudge like salted caramel, chocolate and peanut butter swirl and red velvet cheesecake flavor and gave you a free chunk of it if you spent more than $10.00. One of the perks to shopping in this area was the “Golden Ticket” that was provided as a free gift if you spent over $10.00 in any store. It was fun to see so many crafty knitted hats, crocheted gloves, and colorful socks of all kinds. Wonderful place to go if you like unusual things “Keep Portland Weird” that you don’t necessarily find in the department store. I also felt great knowing I was supporting a community of small business owners. It began to snow outside, so I kept warm and dry inside until it was time to drive back to get my husband at his office. Make sure to watch the video I made while enjoying the fun day. I hope after reading my blog you will make it to Portland too and have as much fun as I did exploring the city. I’d like to share my favorite Christmas Candy that has been made in my family for generations. I’ve been bringing this dish to holiday parties and celebrations for years and everyone is always asking me for the recipe. You will want to double the recipe. Here you go. Please share this blog on Facebook, Twitter and Instagram. I’d love to hear from you in the comment section below. 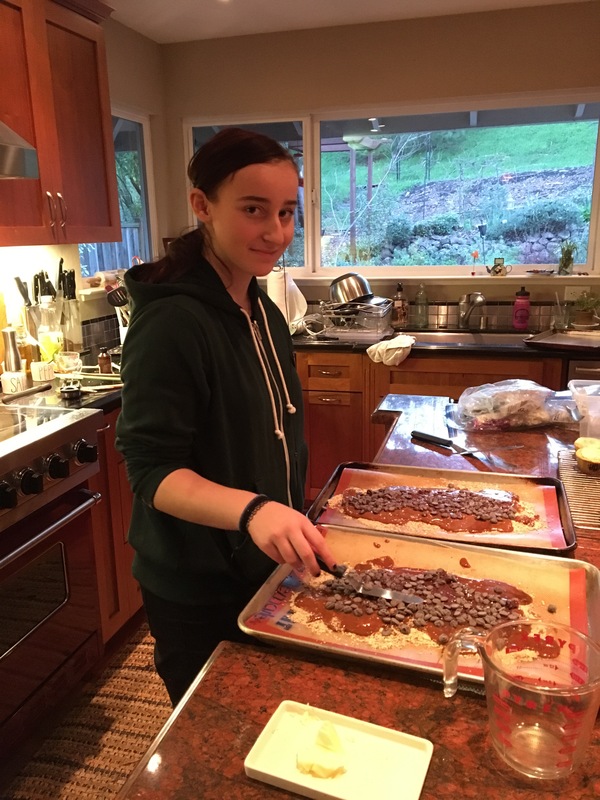 Spread sliced almonds onto a sheet pan and bake in preheated 325-degree oven for 8 min or until brown. When cool, chop finely using a food processor and spread onto two pans lined with sil pat. Place sugar, butter and water in a medium size heavy bottom pan on medium heat. I find that doubling the recipe makes it easier to keep the candy thermometer in the caramel and thus reads easier. Stir until butter melts and mixture is combined, then do not stir. Boil until thermometer reads 285 degrees. Remove from heat and add vanilla and baking soda. Stir with wooden spoon and pour onto nuts. Spread evenly and quickly put chocolate chunks onto warm caramel to melt. Spread chocolate then cool in fridge, freezer or on counter until set about 1 hour. Recipe Adapted from Rose Levy’s Mahogany Butter Crunch Toffee.